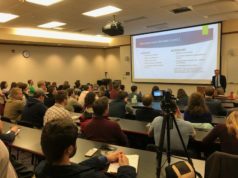 Faculty were split on the social ram­i­fi­ca­tions of mar­i­juana legal­ization in Michigan during a panel dis­cussion this week. 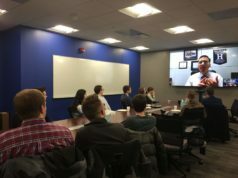 On Feb. 5, Hillsdale’s chapter of Cit­izens for Self-Gov­er­nance hosted a dis­cussion panel on the legal­ization of mar­i­juana. As Pro­fessors Angelica Pytel, Roger Butters, Gary Wolfram, Paul Moreno, and General Counsel for Hillsdale College Bob Norton explained the legal­ization process, they con­cluded that there is still plenty of uncer­tainty sur­rounding the new legal­ization and, whether good or bad, there are going to be major societal ram­i­fi­ca­tions from the legal­ization. “Those of you who know Tom Petty know that the proper name for mar­i­juana is ‘Mary Jane,’” said Pro­fessor of Political Economy Gary Wolfram. Vis­iting Lec­turer of Biology Pytel wanted to clearly explain what mar­i­juana is. She reminded everyone that cannabis is a species of plant, not a drug, and many dif­ferent organic products can be derived from cannabis. While those products include mar­i­juana and cannabi­noids, the hops in beer can also also be derived from cannabis. Pytel wanted to make it clear that cannabidiol, which comes from cannabis, can be used and abused. “Does con­suming cannabis products cause harm? The answer is that any­thing can cause you harm,” she said. Once Pytel had clearly defined mar­i­juana and its effects, Norton focused on the legal side of Michigan’s legal­ization of mar­i­juana. He reminded the audience that medical mar­i­juana was actually legalized in Michigan in 2008; now it is also legalized for recre­ational use. 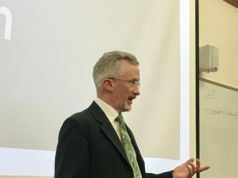 Norton explained the specifics of the legal­ization in Michigan, pointing out that Michigan has the most lenient mar­i­juana laws in the country, even more lenient than the laws in Cal­i­fornia. “The law now says you may have mar­i­juana about your person. You can have 2.5 ounces on you or 10 ounces at your home, or 12 mar­i­juana plants at your house, but you can’t sell it yet,” Norton said. Butters, asso­ciate pro­fessor of eco­nomics, addressed the effects that legal­ization of mar­i­juana would have on taxes. He pointed out argu­ments in favor of legal­ization: A tax on mar­i­juana would gen­erate money, and legal­ization would fight black market trade of the drug. Butters said there are, however, argu­ments on each side, and legal­ization is more of a societal issue than just a purely eco­nomic one. According to Pro­fessor of History and Dean of Social Sci­ences Moreno, our under­standing of drug legal­ization falls short. “I think it’s a great failure of under­standing history that we are ven­turing again into this question of drug legal­ization,” he said. Moreno argued that the history of legalized drugs shows that their legal status actually led to more addiction, and addiction changed behavior and led to more societal issues like traffic fatal­ities, domestic abuse, illness, and work pro­duc­tivity. He pointed to the legal­ization of mor­phine during the Civil War: People even­tually became addicted to mor­phine although it was only a treatment. The addictive sub­stances that are legal in the U.S. now are nat­u­rally leading to more addicts, Moreno said. There are an esti­mated 15 million alco­holics and 50 million nicotine addicts, but only about 1.5 million cocaine addicts in the U.S. now. Part of that is because cocaine is illegal, even though it is much more addictive, according to Moreno. “Legal­ization of any drug usually leads to an increase in the use of other legalized drugs,” Moreno said. Wolfram ended the panel dis­cussion by saying there is still a lot of uncer­tainty on the subject of legal­ization. “Markets don’t like uncer­tainty and we have a great deal of uncer­tainty in this industry,” he said. The greatest uncer­tainty arises from the dis­connect between federal law and state legal­ization of the drug. Although states are legal­izing the drug, the federal gov­ernment still clas­sifies it as a Schedule I drug. Most Schedule I drugs are nar­cotics like LSD, Heroin, and Ecstasy. This uncer­tainty is simply not helping the issue, according to Wolfram. While there may be eco­nomic ben­efits to legal­ization, the uncer­tainty at the state and federal level pre­vents any kind of surety. All the pan­elists agreed that no matter what the ben­efits and draw­backs of legal­ization are, there will be major societal impact and it is important to under­stand the nature of the drug and its physical, eco­nomic, and societal con­se­quences.